For dinner today, I prepared a simple saute with seitan and mushrooms. I had found at Trader Joe's a broccoli slaw with shredded broccoli stalk and carrot; I served it with Jamaican Pickapeppa sauce drops and a pickled sweet red pepper. I also served a prepared artichoke salad that I had purcased at Whole Foods Market. I am going to be teaching, starting in about a month, a new photography class meant for new parents and parents-to-be at UNC Hospitals in Chapel Hill. They need me to become an employee to teach, so I went through a day and a half of orientation, ending today, and also had to visit the hospital for parking and an ID badge. On my way home, I picked up from Trader Joe's some garlic fries and guacamole. I heard that the non-soy sunshine burgers that we like now come in a barbeque flavor, and I picked that up a few days ago. 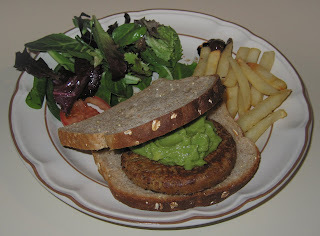 I made a simple burger on interesting bread made with quinoa and whole wheat that I found at Trader Joe's (the bread was good! ); dinner was liked by all. A good friend of ours came over today and I just had to make my Conference Call Risotto. 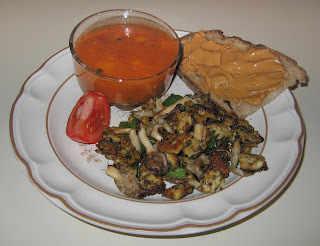 I used a package of oyster mushrooms and about two small handfuls of brown cremini mushrooms. I'm so delighted that my father-in-law visiting from India has been enjoying my cooking, and I think tonight's may have been his favorite dinner (though he very kindly says all the meals are very good! 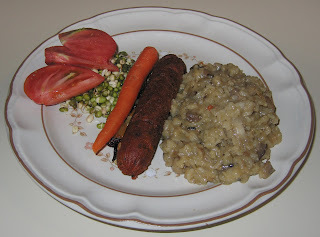 ), which included a vegan Field Roast Grain Meat Company artisanal chipotle sausage. My fellow photographer friend Lisa and her husband joined us for the evening today. I love cookign for our guests, but she insists on making our get-togethers potlucks. This time she brought a delicious thick dhal. I made a simple spinach-tempeh saute and served this delicious pretzel-like bread that Weaver Street Market in Carrboro has once in a while. I used Seeds of Change brand Tuscan Style Rice and Beans boxed dinner kit as a base for tonight's dinner (I think this is discontinued; it is definitely vegan, but the company's website only lists a Siena version that has turkey products in it). I had to saute the rice and beans for a few minutes, till the rice browned, then added two cups of water and their seasoning packet, then simmered for 15 minutes. It turned out well - my father-in-law enjoyed it, though my wife didn't particularly like it. 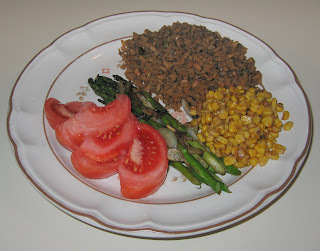 I also introduced my father-in-law to asparagus by serving it sauteed with shallot. I was surprised that he wasn't familiar with asparagus, but was happy that he liked it. He has some problems chewing, so next time I prepare it, I probably will chop it. I also made some corn with chili powder, Earth Balance margarine, and salt mixed in. Yesterday, I brought my father-in-law to my photography class, then also met my baby and wife for a very nice meal at Panzanella Restaurant in Carrboro. He liked his pesto pasta, and I loved my pesto pizza with artichokes and mushrooms. I had a can of heirloom black beluga lentils and also a can of pureed sweet potato that occurred to me would go great together. Black belugas are one of the smallest lentils and are named because they look like shiny caviar when cooked. In a saucepan, I briefly cooked in a little oil about 1/3 of a yellow onion, cut to a medium dice, then added the can of the lentils, reducing the heat to a medium-low. I am actually writing this a day later, but remember mixing in a variety of spices, such as chili powder, and some fresh rosemary needles. 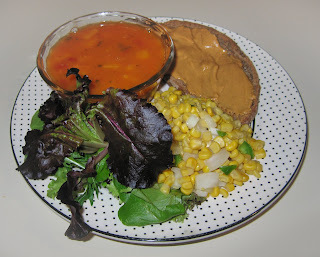 A minute or two later, I added the can of sweet potato, and just let it all cook on a low heat till I was ready to serve. 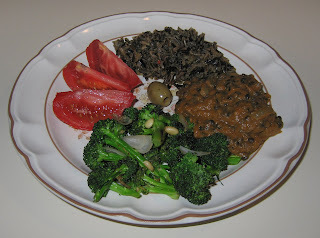 I also made some wild rice, as well as broccoli with shallots. I was delighted that my father-in-law enjoyed this meal, as did we! We're lucky to have our baby's maternal grandfather visiting! He took a 15-hour direct flight Mumbai-Newark and then connected on down here, getting here before 11a. We were delighted for him to meet our little 2 1/2 - month old baby! He will be with us for something between a month and a half and three months. My father-in-law ("Baba") is very easy going and enjoys a variety of foods. Still, I wanted to start off easy with him and come up with something that would be a bit familiar. I made it up on the spot as I was cooking, but came up with a reasonable Indian-looking and tasting dinner. 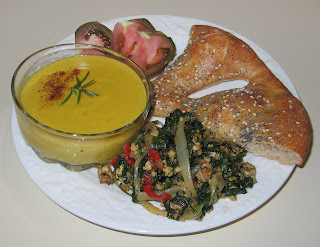 I made a red lentil (I know, it cooks to yellow-green) dhal. 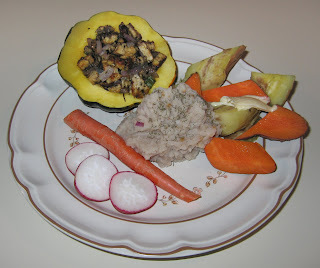 I took a yellow crookneck squash and cut it into maybe 3/8" slices, then quartered the slices. I sauteed the slices, along with a medium shallot, diced into cubes maybe 1/4" thick, just for a few minutes till softened; in the last half minute, I added a few pinches of cumin seed. In the meantime, I started the lentils and water in a 1:3 ratio heating, along with a vegan bouillon cube. 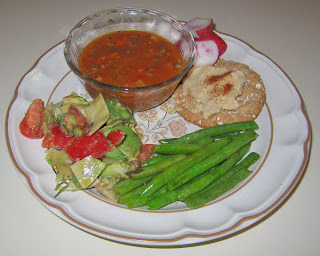 As this came to a boil, I added the sauteed vegetables and a bit of salt, along with a few small bit of jalapeno pepper, then simmered for about a half hour, covered (the lentils generally take 30-45 minutes, but 30 was quite enough in this dish). For the main dish, I peeled then cubed an eggplant into fairly small, perhaps 3/8", cubes, and sauteed it in garlic grapeseed oil. Eggplant acts like a sponge, so I had to add some more oil a few times. I let the eggplant go for maybe five minutes till it cooked down and was gently browning. I then added a bit of jalapeno and about a half of a medium red onion, cut into a medium (3/8" or so) dice. A few minutes later, I took a quarter cabbage head, removed with a "V"-shape cut the white solid core, and cut the cabbage into strips maybe 1/2" x 2 1/2". 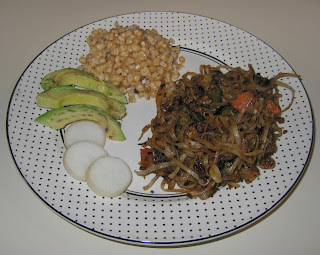 I added the cabbage as well as a quarter bell pepper cut into medium chunks. A few minutes later, I added maybe 2 tablespoons of coarsely chopped yellow onion to give the dish an extra kick, as well as bits of salt, and both chili powder and hot red pepper flakes. A minute or so later, I added a little cumin seed and a few pinches of my wife's Mom's homemade garam masala (one could just add turmeric), then about 3 ounces of water. I let the water cook into the vegetables on a simmer for a few minutes. 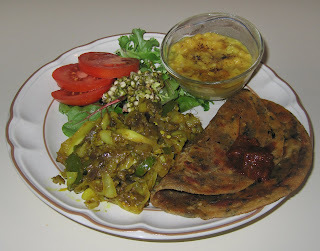 I heated some prepared fenugreek-leaf stuffed parathas, and also included some South Indian lemon pickle. Everybody enjoyed the meal, and it seemed to not be too bland for Baba! Tonight I had to make a quick meal before a film. Our local soup maker made this as-always excellent soup, which I heated, and served. We can always count on her for hearty and tasty soups! We've been rearranging and organizing the kitchen shelves, so have not been cooking for a few days now. For tonight's meal, I started about half a package of tempeh, cut into approximately 1" x 3/4" rectangles, sauteeing over medium-high heat, using garlic grapeseed oil. I used onion, but wanted a juicier onion for this dish; I used about a third of a sweet onion cut into thin, long strips (maybe 1" x 1/4"). 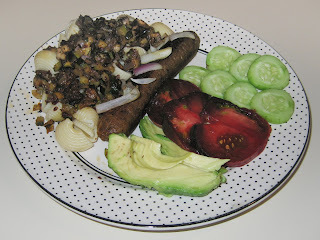 I delayed adding most of the onion till the tempeh was starting to brown, reserving a small amount of onion. 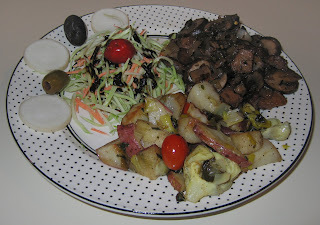 I also added a handful of shiitake mushrooms that I had cut into thick slices (maybe quarters of each mushroom). A few minutes later, I added broccolini that I had cut into maybe fifths, and let it cook for two or three minutes, till the broccolini turned dark green. I added the reserved onion, as well as a few shakes of "liquid smoke" and soy sauce, as well as a few pinches of dried dill weed. 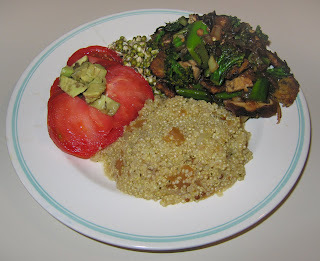 I made a simple side quinoa dish by cooking the quinoa (2 parts water to 1 part quinoa) along with a cube of vegan bouillon and a few slices of onion. I mixed in salt and some pickled tomato that I had. Fresh tomato and cubes of avocado rounded out the meal.